Στην ECOFILTER SYSTEMS INTERNATIONAL μποτείτε να βρείτε μια μεγάλη γκάμα καρτούζων ΡΡ απο τις πλέον κλασικές μέχρι σπάνιας χρήσης και φυσικά στις καλύτερες τιμές. 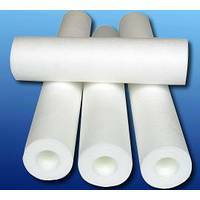 PP super-fine fiber filter material is a new type of filter material made of polypropylene special resin with the melt-blown non-woven technology. The fiber of the product, with three-dimensional net structure, decreases the filtering resistance and can contain more dust. The product is ideal to be used in initial, medium and high efficiency filter, self-air-cleaner, vacuum cleaner etc. Due to its low resistance and high efficiency. The product can also be used for liquid filtration, oil stain disposal, water purification and other purposes. The product is from hydrocarbons with innocuity, insipidity, white and light character. The fiber distributes uniformly, softly and compactly, having the trait of high intensity, low resistance and high efficiency. Acid and alkali resistant, with high melting point(167-174centidegree)and stable performance. The material can be used for air filtration and can filtrate undissolved impurities in organic solutions. Κάντε κλικ παρακάτω για να προσθέσετε το ΦΙΛΤΡΑ ΣΤΕΡΕΩΝ ΡΡ - PP FILTER REPLACEMENTS (1) to your wish list.